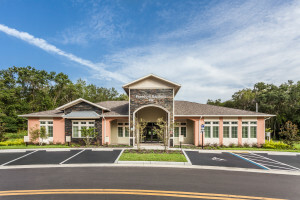 Brooksville, Florida (May 23, 2018) – Housing Trust Group (HTG), one of the nation’s leading developers of affordable housing, has closed on financing to begin construction on phase two of Freedom Gardens, an affordable apartment community located in the Central Florida City of Brooksville, an hour north of Tampa. HTG recently built 96 new affordable apartments at Freedom Gardens in 2017. The second phase of the community will deliver an additional 94 affordable apartments by June 2019. Monthly rents will range from $480 to $997. Also in Hernando County, HTG recently broke ground on 92 new affordable apartments at its Hammock Ridge community in Spring Hill, Fla. Combined, Freedom Gardens and Hammock Ridge are creating 386 new affordable apartments for the families of Hernando County. Freedom Gardens II was financed with an $8.4 million construction loan from CitiBank backed with a Multifamily Mortgage Revenue Note from Florida Housing Finance Corporation; permanent financing from CitiBank of up to $5.2 million; $5.9 million of housing credit equity (4%) through Raymond James; and a $5.5 million State Apartment Incentive Loan (SAIL) with $493,400 “Extremely Low Income” (ELI) loan, both through Florida Housing Finance Corporation. Located at 932 Freedom Way, the second phase of Freedom Gardens will consist of four garden-style mid-rise buildings with 32 one-bedroom, one-bath apartments; 28 two-bedroom, two-bath apartments; and 34 three-bedroom, two-bath apartments. Ten units will be set aside for residents earning at or below 40 percent of area median income (AMI); the remaining 84 will be for residents earning at or below 60 percent of AMI. Amenities at Freedom Gardens include a 4,806-square-foot Grand Clubhouse with a cyber café, 1,000-square-foot pool, after-school care, laundry facility, exercise room, walking path, central community gathering area and a pet park. The architectural design is based on a “French Country” theme, featuring vertical accents, molded trim, and a color palette of stucco. Freedom Gardens has achieved a green building certification under the National Green Building Standard (NGBS) administered by the National Association of Home Builders. HTG has seven other affordable housing communities in various stages of construction in Florida including the second phase of Hammock Ridge in Spring Hill; Arbor View in Margate; Covenant Villas in Belle Glade; Heron Estates in Riviera Beach; Twin Lakes Estates in Lakeland; Douglas Gardens V in Pembroke and Princeton Park in Miami.